Margins for products sold by Canadian wholesalers, as measured by the Wholesale Services Price Index (WSPI), were up 0.3% in the third quarter. Overall, four of the eight subsectors posted margin gains, while the remaining subsectors posted declines. Building materials and supplies merchant wholesalers (+3.7%) were the largest contributors to the quarterly increase, as a result of higher margins for metal service centres (+7.9%), plumbing, heating and air-conditioning equipment and supplies (+6.3%), and electrical wiring and construction supplies (+6.5%) merchant wholesalers. Margins for motor vehicle and motor vehicle parts and accessories merchant wholesalers rose 3.2%, mainly due to new and used automobiles and light-duty truck merchant wholesalers (+8.6%). Higher margins for petroleum and petroleum products (+1.9%) and personal and household goods (+0.3%) merchant wholesalers also contributed to the gain in the quarter. Moderating the quarterly increase in the WSPI was machinery, equipment and supplies merchant wholesalers (-1.7%), with computer, computer peripheral and pre-packaged software (-9.9%) merchant wholesalers contributing the most to the decline in margins for this subsector. Lower margins for miscellaneous merchant wholesalers (-1.4%) also moderated the quarterly increase in the WSPI. Farm products merchant wholesalers recorded the largest decrease (-6.0%) in the third quarter, mostly due to lower margins at oilseed and grain merchant wholesalers (-8.1%). Food, beverage, and tobacco merchant wholesalers (-0.6%) also posted margin declines. The WSPI rose 1.3% in the third quarter compared with the same quarter in 2017, as margins were up in five of the eight subsectors. This was the 20th consecutive year-over-year increase in the index. Building material and supplies merchant wholesalers (+4.9%) contributed the most to the year-over-year margin gain in the third quarter, largely as a result of higher margins for metal service centres (+18.9%). Miscellaneous (+3.6%) and petroleum and petroleum products (+3.5%) merchant wholesalers also contributed significantly to the year-over-year increase. Margins were also up for personal and household goods (+0.8%) and motor vehicle and motor vehicle parts and accessories (+1.0%) merchant wholesalers. The year-over-year gain in the WSPI in the third quarter was mainly offset by lower margins at machinery, equipment and supplies (-0.8%), followed by farm product (-4.7%) merchant wholesalers. Margins for food, beverage and tobacco merchant wholesalers (-0.1%) edged down year over year. The Wholesale Services Price Index (WSPI) represents the change in the price of the wholesale service. The price of the wholesale service is defined as the margin price, which is the difference between the average purchase price and the average selling price of the wholesale product being priced. The WSPI is not a wholesale selling price index. With each release, data for the previous quarter may have been revised. The series are also subject to an annual revision with the release of second quarter data of the following reference year. The indexes are not seasonally adjusted. Data are available at the Canada level only. The infographic, "Wholesale Services Price Index (WSPI) 2008 to 2017," which is part of Statistics Canada — Infographics (Catalogue number11-627-M), is now available. 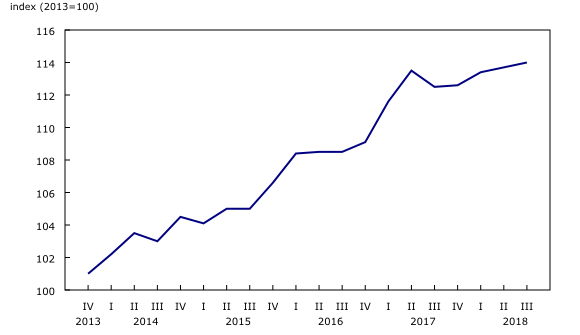 It demonstrates how margins in the Canadian wholesale trade sector have evolved from the first quarter of 2008 to the fourth quarter of 2017. A Historical Timeline of Canadian Producer Price Statistics, which is part of the Prices Analytical Series (Catalogue number62F0014M), was created to showcase the key milestones in the history of Canadian producer price statistics. This historical timeline contains answers to questions such as: Who collected Canada's first statistics? What do Canadian producer price indexes measure?